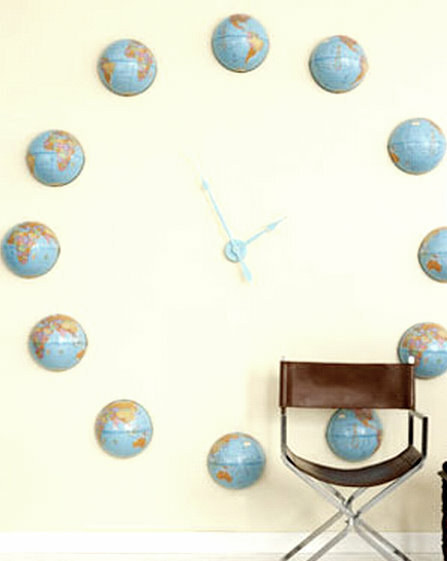 This funky globe clock is sure to wow when understatement just won’t do. Surface-mounted wall clockworks kit; light-blue spray paint; craft knife; six 6-inch-diameter lightweight cardboard globes; bookbinder’s tape; tape measure; 4 feet of cotton string; thumbtack; pencil; 12 screw-in cup hooks; glue (optional). NOTE: For all clock projects, clockworks kits (including hands and movements) can be purchased at craft stores. Select a kit with a shaft slightly longer than the thickness of the clock. 1. Paint hands and wall-mount sections of clockworks kit; let dry. 2. Using craft knife, cut each globe in half; cover edges with bookbinder’s tape. 3. Mark desired center of clock on wall. Finished clock is about 6 feet across, so make sure your wall will allow 3 feet clear in each direction from mark. 4. Tie string to tack; insert tack into wall at mark. Measure 3 feet from tack and tie pencil to string at that point. Holding pencil straight down, lightly mark circle on wall by rotating string around center. 5. Make 12 cross marks on circle, starting at center top and bottom and level at each side, then placing two marks spaced evenly between each pair of the first four marks for each hour. 6. Center a globe over each mark; lightly outline globes. 7. Screw cup hooks into wall just below center top of each circular outline. 8. Mount clockworks at center mark. 9. Erase all pencil lines. Hang a half-globe on each hook, gluing globe to hook if desired.